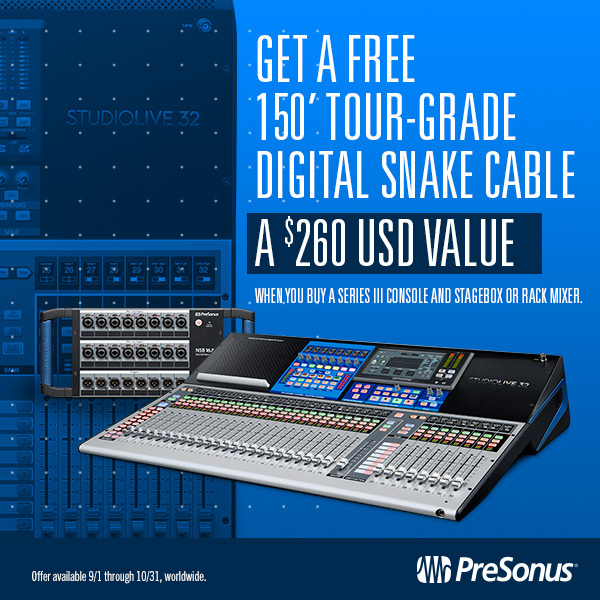 Buy a StudioLive Series III Console and StageBox, Get a 150′ Digital Snake Cable for free! What’s better than buying a StudioLive Series III mixer? How about buying a StudioLive mixer and getting a FREE 150 foot Digital Snake! Now through the month of October, get a FREE Digital Snake when you purchase a StudioLive Series III Console and StageBox or Rack Mixer. All you need is to make your purchase and then fill out a simple rebate form attached below and you’re good to go! PreSonus knows what producers want, and with the new Series III StudioLive, is very much trying to put it all in one box. If you’re thinking of upgrading to a project-studio setup and want a bundle that does everything, do consider StudioLive and these new Series IIIs. Just add speakers and a DAW (or not, if you don’t want to!) and you’re away. + Lovely logical layout – easier to use than the previous version! This offer expires October 31, 2018 and is available worldwide. Click Here to find your regional PreSonus Dealer! Posted in Promo / Discount | Comments Off on Buy a StudioLive Series III Console and StageBox, Get a 150′ Digital Snake Cable for free!